New Urbanism is about beautiful, energy efficient cities. This page is down at the micro-scale, and is about individual buildings, and how to build energy-efficient homes and offices. We can now build comfortable low energy apartments that keep us warm in winter and cool in summer, with much lower or even zero air-conditioning bills! Even the materials we use can improve minimise impact on the environment. But let’s start with the design. First, let’s design our home or office with our local climate in mind. 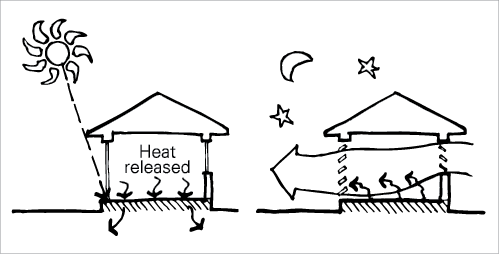 Most climates can use thermal mass to store an ambient, comfortable temperature, but but how they do so in each climate will vary according to where we live. There are more guidelines here, as I’m not going to analyse all the options but just want to highlight that local considerations are important. The graph below shows how the right materials positioned in the right place store the sun’s heat for later that day. 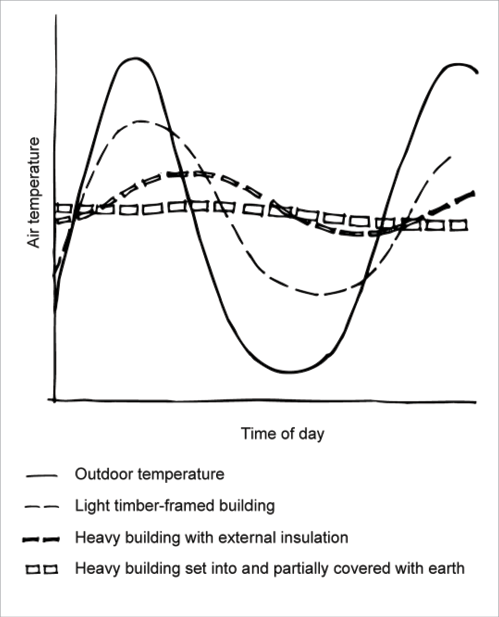 Note how the single unbroken line rises and falls with the outside temperature, but a clever building with good heavy, sun-absorbing materials and insulation can keep your home or office building much more comfortable. So how does it work? There are special plans for different climates. 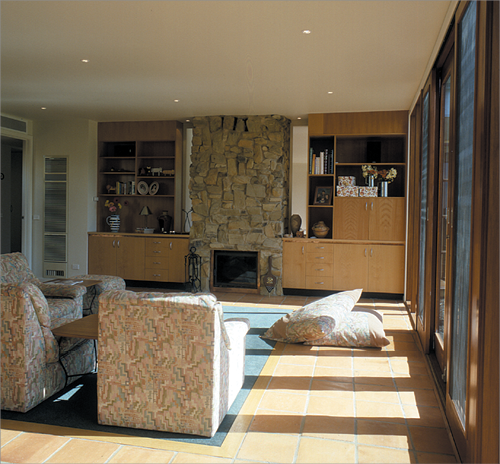 Tropical plans are all about cooling the house, while sub-tropical areas like Sydney have more thermal mass positioned for heating in winter, and cooling in summer. Remember, while these diagrams show individual homes, we’re actually after eco-designed apartments. Indeed, the whole Your Home site has more detail about environmentally friendly, energy efficient designs and materials than I want to go into right now. You can download their free 10 page PDF YOURHOME-2-PassiveDesign-9-ThermalMass-(4Dec13) if you’re planning a renovation or want more detail. It covers glass-to-mass ratios for different climates, building for cool temperate and alpine climates and hot dry climates, positioning, materials, foundations and concrete slab work, where to put the termite barriers and even Phase Change Materials (PCM’s) that absorb heat and then release it later at night. 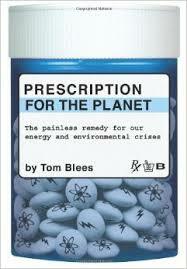 It’s a comprehensive site, and has PDF’s on saving water in the home, materials, energy, and so on. I highly recommend a good browse and downloading some of their PDF’s for later. See the Passive house wiki. But, while increased scale improves sequestration, it poses greater challenges for overall energy use, especially for high-rise buildings. Studies in the tropics have shown high-rise buildings typically demand higher energy intensity than medium-rise, findings that correlate with recent analysis by Hilson Moran in the UK to determine the effect of building form on energy consumption and CO2 emissions. Even the energy intensity of Ken Yeang’s bio-climatically designed ‘Menara Mesiniaga’ tower has been calculated as approximately twice that of a Passivhaus building. While energy embodied in materials and construction activities is important, operational energy demand still dominates over a building’s lifetime energy use. Studies show that, in a typical building, total in-use energy could surpass embodied energy after as little five years. Even in a low-energy design, it will potentially dominate after 20 years. The evidence again points toward a more humane scale of building also achieving a more sustainable solution overall. All of this ultimately emphasises the importance of research and evidence informing practice, especially for buildings making grand claims about environmental performance. However, as highlighted by Edge Debate 46 and 54 ‘A New Professionalism?’ the built environment industry currently lacks the culture and practice of genuinely evidence-based design and fails to develop a crucial shared knowledge base, arising from the gaps between professions, between practice and academe, and between design assumptions and how buildings perform in use. In this context, the influence of high-profile practices is enhanced, perhaps artificially so, which comes with added responsibility. ‘Farrells Focus’ brings this conversation to the fore, leading us to ask, is ‘raising’ the profile of bamboo as a building material for high-rise useful or irresponsible? Architects easily become enamoured with a new material or structural system, especially when a top-flight ‘form giver’ architect pioneers it. This fascination with new forms must not distract us from the need to also recognise that in good design form follows function, and, given that low environmental impact and energy consumption is now one of the most important functions, the forms must be derived from firm evidence.